End of Summer Zucchini Casserole :: Oracibo.com - Food, Travel, Design and Cooking! We’ve headed into fall and the remaining Romanesco zucchini need to be used…now what? I’d pretty much run through the “zucchini repertoire” and I needed to come up with something for dinner. There’s that leftover barbecued corn from the night before…hmmm. 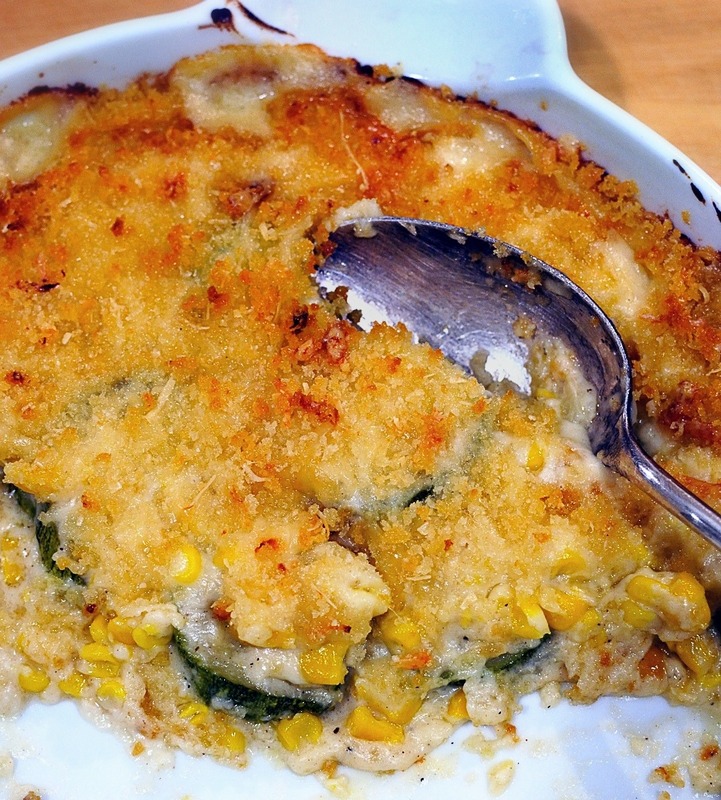 Here it is…kind of macaroni and cheese without the macaroni using zucchini and corn instead! We made oven-fried chicken to have with it but it could easily be a main course. Leave out the bacon if for a vegetarian version. Place the oven rack in the lower third of the oven & put a large shallow rimmed baking pan on the rack, then preheat the oven to 475 F. Toss the zucchini with the EVO, salt & freshly ground black pepper in a medium sized bowl; place the zucchini rounds in one layer onto the preheated baking pan & roast for 5 minutes; turn zucchini rounds over & continue to roast for another 4 or 5 minutes until the squash is just tender. Set aside. Reduce the oven to 400 F.
Fry the bacon until almost crisp; remove to paper towels to drain; drain off excess bacon fat, leaving 1 Tbsp. Sauté the onion in the bacon fat until softened, about 5 – 7 minutes, set aside. While the onion is cooking, chop the bacon into bits & set aside. Mix the grated cheeses together. Set aside 1/3 cup of the cheese mixture for the Panko topping. Combine the Panko crumbs, melted butter, 1/3 cup reserved cheeses, the bacon & the parsley; set aside. In a microwavable bowl, melt the butter, covered. Whisk in the flour, return to the microwave & cook at level 5 for 1 – 2 minutes, until bubbly; remove from the microwave & whisk in the milk very slowly. Microwave the mixture, in 1 minute intervals, whisking each time, on med- high heat, until it has thickened & come up to the boil. Remove from the microwave; whisk in the sauteed onion, cheeses, salt & pepper to taste, paprika & Tabasco sauce; set aside until ready to use. Grease a 9” shallow baking dish. Place the zucchini rounds in the dish; scatter with the corn; pour the cheese sauce over the veggies & scatter with the Panko crumbs. Place in the oven & bake 15 – 20 minutes until bubbly & lightly golden on top. Let rest for approximately 5 minutes & serve.